I still remember the first group of chaplains that came to us and asked for a ‘deployment-ready’ version of the BibleStick. None of us had any idea what this would grow into. More than 130,000 Military BibleSticks are now in the hands of U.S. chaplains and troops worldwide. Faith Comes By Hearing, the world’s leading Audio Bible ministry, began this military outreach with a small, initial shipment to a handful of chaplains in 2008. The portable, pocket-sized digital audio players – which contain the complete dramatized New Testament – became an instant hit with the troops. The ministry has now fulfilled requests from more than 700 chaplains across every branch of the military. As of the date of this release, 130,170 BibleSticks have been shipped to chaplains for use in pre-deployment briefings, counseling sessions, Bible studies, weekly chapels and to meet direct requests from the soldiers they serve. However, the ministry still continues to face unmet demands as requests continue to flow in regularly – ranging from 500 to as high as 5,000 a week. While the Fourth of July is not typically seen as a gift-giving holiday, Faith Comes By Hearing is asking Americans to partner with them in praying for our troops while also providing them with the spiritual protection that only comes from God’s Word. The package includes the BibleStick, ear buds, an MP3 disc with the same dramatized New Testament to share with their friends, and a postage-paid response card to request Audio Bibles for their spouse and children back home. As a result, a $25 donation not only covers the service member, but their family as well. 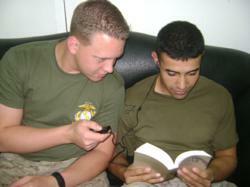 Donations can be made online at http://www.MilitaryBibleStick.com, or by calling (800) 800-2555.